Thanksgiving is a food lover's holiday and around here it has certainly been a week of good eats. The festivities started with a potluck lunch at work on Tuesday. I contributed a main dish- harvest pilaf and a dessert- pumpkin flan. Harvest pilaf was nothing but my standard biryani recipe. I reduced the amount of rice, and instead loaded up the dish with all the vegetables that to me are the real stars of Thanksgiving. So in went a tray of roasted sweet potatoes and carrots, and another tray of roasted cauliflower, beans and zucchini. I've made pumpkin flan a few years ago and we had enjoyed it- pumpkin flan has all the flavor of pumpkin pie but in a cool and light custard. This time, I used this recipe from Lucinda Scala Quinn. 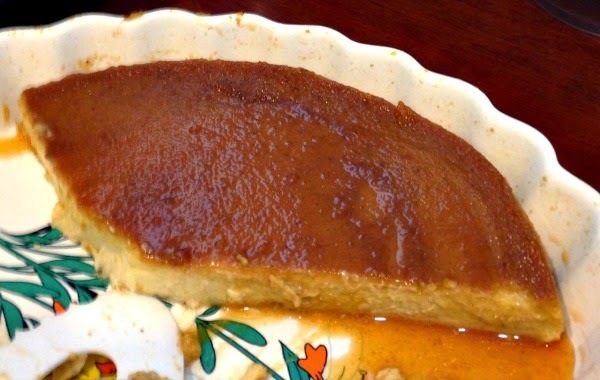 It uses pantry ingredients (and at this time of year, I count canned pumpkin as a pantry ingredient) and makes a nice 9 inch flan. The minor changes I made to the recipe: (1) I used only 1/2 cup of sugar in the flan mixture instead of 3/4 cup, (2) I used regular granulated sugar and used a dollop of molasses to make it "brown" and (3) I made the caramel in a small saucepan instead of in the oven. For the bain marie (water bath that keeps the flan smooth and tender), I used a huge foil roasting pan from the supermarket. You only have to buy it once and then you can keep using it any time you need a bain marie. We had a wonderful spread, including deviled eggs, spinach quiche with a puff pastry crust, a salad with kale, shredded brussels sprouts and dried cranberries, corn casserole, mashed potatoes, mac and cheese, cranberry sauce with orange zest. The salad was my favorite dish, a crunchy and fresh counterpoint to all the other heavy dishes. I loved it so much that I made something like it to take to our Thanksgiving dinner- which was another potluck at a friend's home. My starting point for the salad was this recipe from The Kitchn. 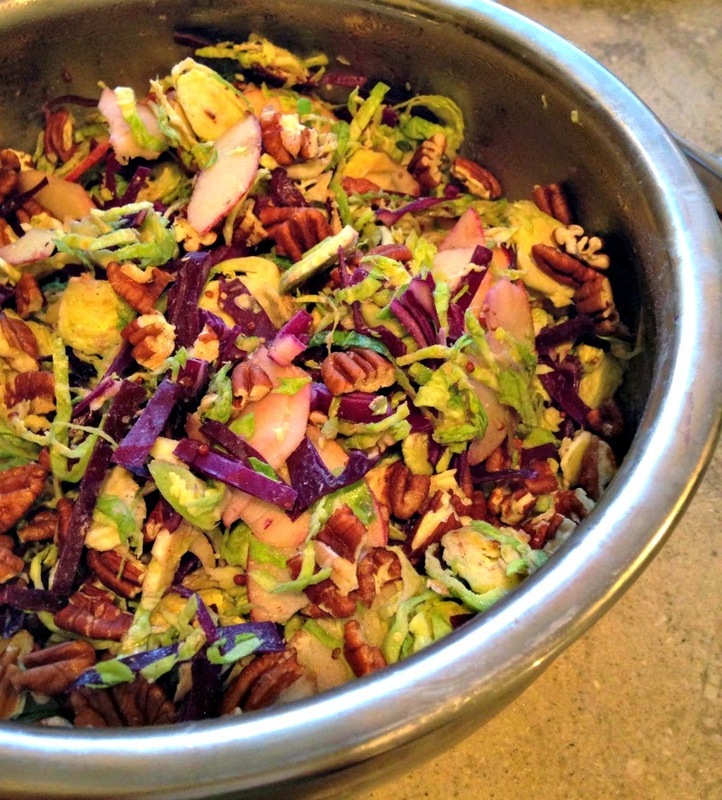 Here's how I made my version of Shredded Brussels Sprouts Salad. Lop the stem ends off 1 lb of fresh brussels sprouts. Using the slicing disk of the food processor, shred the sprouts. Also shred a cup or so of red cabbage. Core a crisp apple (like honeycrisp or gala or fuji) and make thin slices with a mandoline. In a small saucepan, melt 4 tbsp. butter and cook it until browned and nutty. In a large bowl, whisk the brown butter with 2 tbsp. balsamic vinegar, 1 tsp. dijon mustard and salt and pepper to taste, until the dressing is emulsified. Stir in the chopped veggies and apple slices. (This salad can be made in advance). Top with roasted pecans and serve. For a main dish to take along to the potluck, I started out with the idea of making a butternut squash lasagna. Then I remembered that I had a box of jumbo pasta shells in the pantry and this seemed as good a time as any to finally cook those. Here's what I came up with, a mash up of various online recipes- and it was a resounding success. Peel and cube a butternut squash (there are videos online that teach how to do this safely). On a large baking sheet, toss the butternut squash cubes with 6 unpeeled garlic cloves, olive oil, salt and pepper. Roast at 425F until tender. Cool and peel the garlic. Place roasted garlic and squash (I used 2/3 of the whole large squash here and saved the rest for another dish) in a large bowl. Mash it up coarsely with a fork. Thaw a box of frozen chopped spinach in the microwave, squeeze to remove excess liquid and add to the cooked squash. Mix everything together and refrigerate until you're ready to assemble the pasta. Cook the jumbo pasta shells according to the directions on the box. Here's what the cooked shells looked like- adorable and surprisingly sturdy. Lila was delighted and munched on a couple. I made 2 cups of basic white sauce for this dish. You could use a tomato sauce or no sauce at all. Scoop about 2 tbsp. filling into each shell. In a 9 x 13 baking dish, pour the white sauce. Arrange the shells on top. Scatter with 1/2 cup grated Parmesan cheese. Cover with foil and bake at 350F for 30 minutes, then uncover and place under broiler for a minute or two to get the cheese browned. Ta da. This pasta dish was full of flavor and had a pretty nice presentation (which is rare for me). Each person could conveniently serve themselves a shell or two. I had enough cooked shells left over to make another (smaller) tray of shells the next day. So, tell me, what's cooking in your world? Your Thanksgiving dishes sound so hearty, healthy and delicious. Love that brussel sprouts salad recipe. I have started to enjoy brussel sprouts only recently and your salad is something I would like (and that dressing sounds sooo yumm!!). Such good eats! 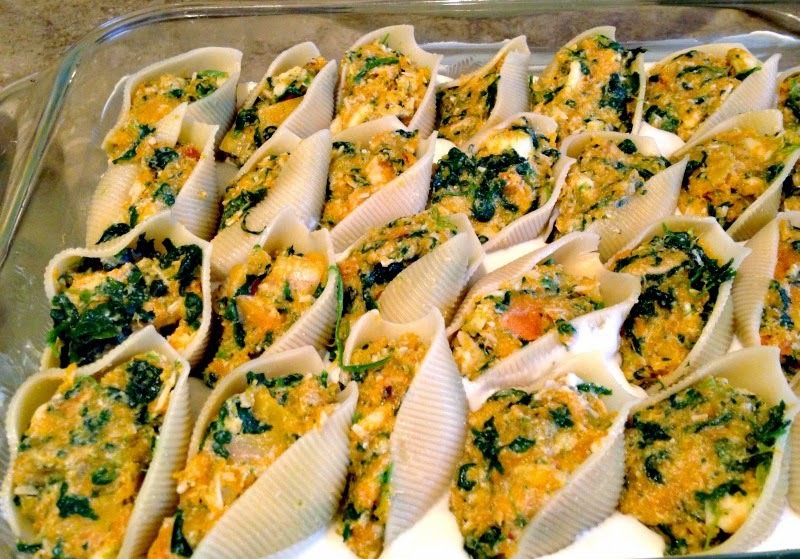 I love the idea of stuffing shells with squash - in fact I need to use up pasta shells as well. Now I know what to do with them. Your potluck was an amazing feast- I really enjoyed looking at the beautiful pictures of the spread- thanks for sharing the link! What a nice spread. The salad and the stuffed shells look great. I am sure I'd like to try those at the next potluck! That's awesome to get a chance to make old favorites again! Did your parents taste any new foods while they are visiting? 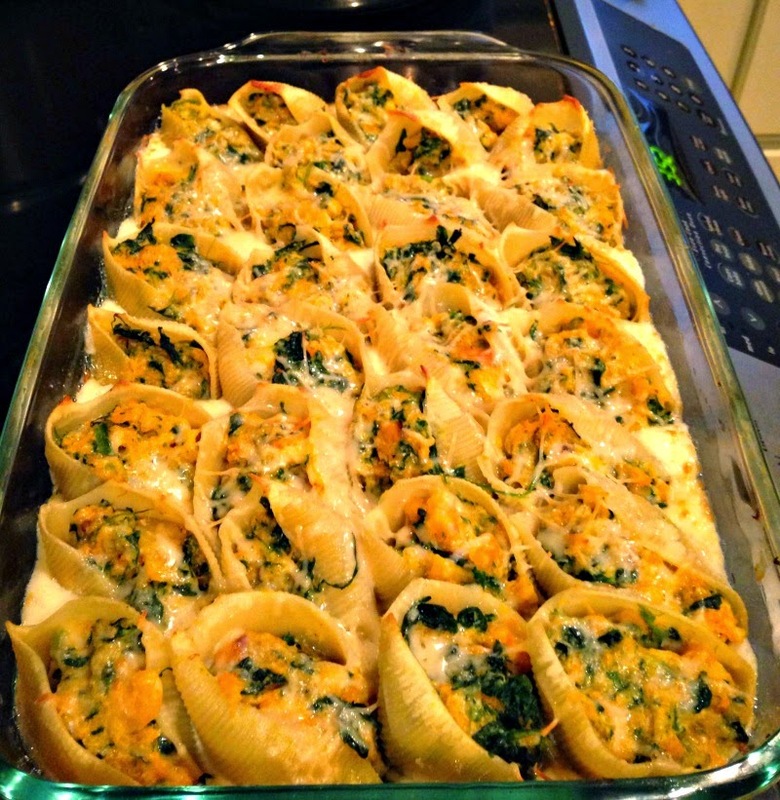 Love how this stuffed shells look. Reminds me of a similar dish I'd made a while ago with lasagna sheets cooked and rolls up around pesto and cheese mix and then baked. They were easy to pick up and eat as bite size appetizers. But next time I'm going with these dainty but big shells and the squash filling, much more healthy I think. I'm trying this year on to include more classic and local(for bay area) winter vegetables in our meals. Previously, I'd given very little thought to the in season aspect of our vegetable shopping but now I'm going to. We do get squash and pumpkin in a cornucopia of variety this time of the year and just looking at them is a pleasure. Greens like mustard and chard also continue to appear in the farmer's markets so those are a must. And slow stews combing veggies and some protein me thinks would set the tone for this cool season. Hi Deepa- Yes! They're very much like lasagna rolls, but easier to make, I would think. I agree with you that winter squash and greens are the stars of the produce section this season. I'll definitely write about Lila and Duncan soon- they're hilarious as ever. Duncan turned 2 years old this week! I am a proud owner of a brand new Ultra wet grinder, thanks to my generous brother and sister-in-law and I can't stop making cloud like idlis! I have cooked and baked all kinds of complicated, challenging foods/recipes with great success over the years but nothing has made me feel so happy. :-)) This truly felt like an achievement, like crossing a milestone in life. Congrats on the wet grinder! And do you know, I totally understand that feeling of joy and accomplishment on finally being able to make cloud-like idlis :) So happy for you! I don't make idlis/dosas all the time but when I do, my friends rave about it and we enjoy every bite. Those jumbo pasta shells look delectable. I will have to make them. Something new I made recently was a smoky three bean soup. I used black eyed, kidney and butter beans. I simmered them in my slow cooker and then added some pre-roasted veggies-onion, garlic, red and yellow peppers and sweet potato. I added canned tomatoes and veg stock for taste. Very hearty. Oh and late one night made a flourless choc cake in a mug in the microwave. Won't be making that again in a hurry. Heh heh. Arpita- your three bean soup sounds wonderful! In fact I would love a bowl right now- it is dreary, drizzly and foggy here today. I'll have to make something like that this weekend. The food all looks so yum! Looks like you guys had a blast. I'm loving the jumbo pasta shells. Just too cute :) Is regular laal-bhopla a good substitute for the butternut squash? 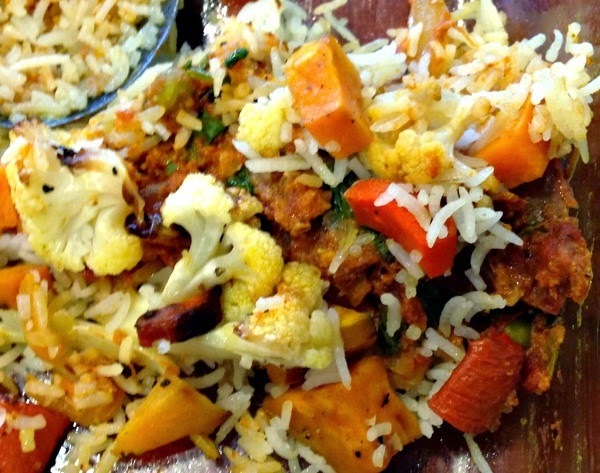 Adding veggies and cutting down on rice seems like a great idea to make healthier biryanis. Oh yeah, laal bhopla would work and so would any other veggies for that matter! Yup, these days I go overboard with the veggies and use rice as a small proportion of the dish. Thanks Anjali! Lila and Duncan are doing great- they're very much into the holiday spirit these days, enjoying cool weather. Ooh Nupur the jumbo shells look so good! I wanted to ask you, what are you doing for teacher gifts this year? You always have great ideas. Wow- you've been a busy bee in the kitchen! I understand the feeling of being "cooked out", on the weekend I threw in the towel and got Chinese take out. This year, I shopped for teacher gifts in India- bought some cute embroidered folders and block-printed cotton scarves from a Rajasthani handicrafts store. So that's taken care of. Apart form that, I am also cooking up various new foods for my mom, who loves to experiment with food found here in US. Stuff like avocado toast, Mac n cheese (I am not a fan of this, but she totally loves it), green smoothies and salads, minestrone soup and other seasonal soups.